Ideally located, hillside villa - nice views. All day sun. 3 minds. to shops. 5 minutes to Moraira's excellent beaches, restaurants and marina. 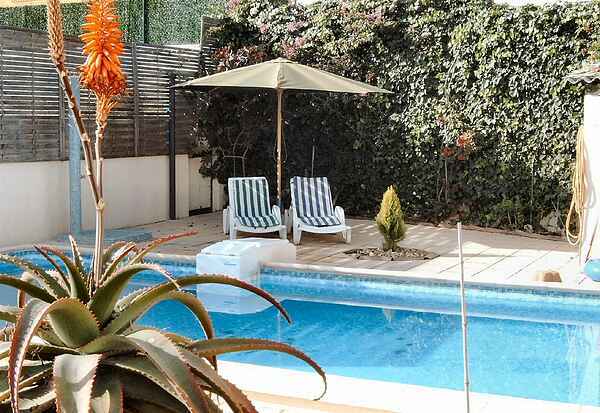 Sleeps up to 5, big roof top terrace with BBQ, private garden, private pool with big terraces. FREE INTERNET ACCESS. The villa overlooks the valley from Teulada to Moraira and Cumbre del Sol. The entrance level comprises kitchen, large dining room and doors opening on to the patio, garden area for sun bathing and 8X4 m pool. Large living room area with sofa, Dining table, Digital Satelite TV with English news channels, DVD player with a selection of DVD movies. Kitchen with large dining room.Two spacious double bedrooms with ceiling fans, a large bathroom with toilet and shower, a other separate toilet with wash basin. Separate wash room with automatic washing machine.